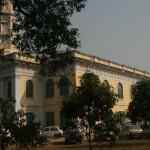 St. John Church established in 1819 in Meerut Cantonment. Bishop Wilson dedicated this church to the people. The church has a sitting capacity of 15,000 people. During the 1857 uprising this church was the scene of heavy fighting between the rebels and the British forces. This entry was posted in St. John Church, Uttar Pradesh and tagged Church. Bookmark the permalink.